Juliana Junior is designed with tall side height to enable excellent utilization of the greenhouse area, and Frame designed is strong profiles that give the greenhouse a light and airy feel. Juliana Junior comes with a hinged stable door. The stable door enables the release of warm air without bothersome draughts along the floor of the greenhouse, which can damage delicate plants. The stable door comes with a lock and key, which enables the greenhouse to be used for storing garden furniture, a lawn mower and similar. Juliana Junior will grace any garden & backyard!!! Standard colors:Dark gray frame ,Black Door and windows. 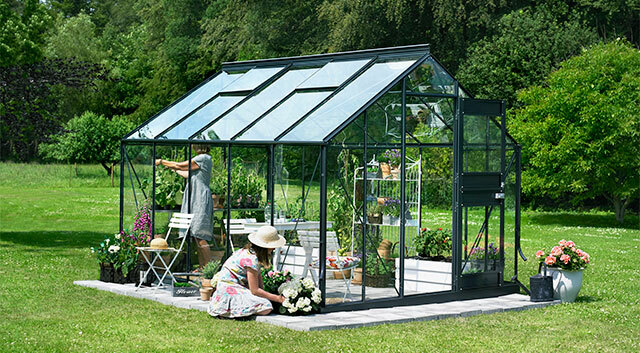 This optional all-steel Base Kit works with the Juliana Junior Greenhouse. 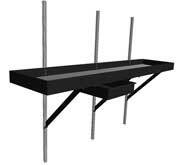 It ensures a stable structure and includes all required fittings. The Juliana Cresting This optional Cresting for Juliana Greenhouses add a unique, classic look to any greenhouse structure. 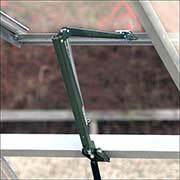 The plastic cresting is installed by fitting it into the ridge bar, and apart from the additional aesthetic value, also works to deter birds from perching on the greenhouse roof.